The basic plot of the book is covered, and the question of where Joan Lindsay got her ideas is discussed. It was at the publisher's request that the final chapter, chapter 18, was removed from the publication of the book. Her wording in the book kept the matter of whether or not the events were factual up in the air. The making of the movie is discussed and, again, the 'mystery' is discussed. The person writing this booklet notes that he was interested particularly in some 'clues' that were found in Chapter 3, these being 'drifts of rosy smoke' and 'the beating of far-off drums.' He also notes that the original transcript of chapter 18 is gone, probably destroyed in some manner. The chapter 18 that has been printed is based, apparently, on a carbon copy found in her papers. 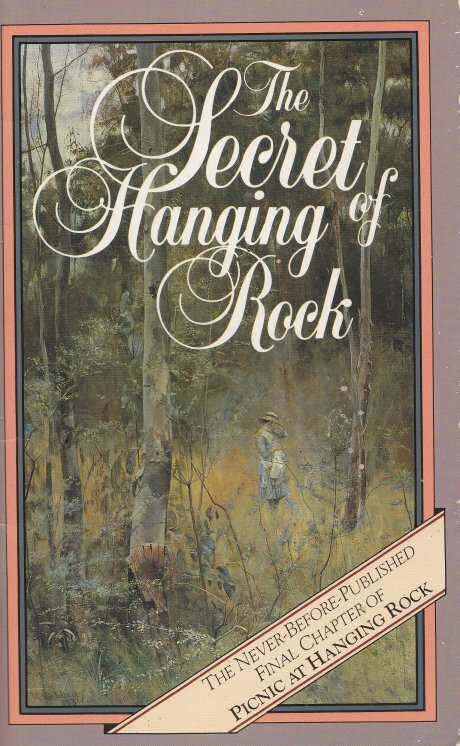 He also talks about the book The Murders at Hanging Rock, which was an attempt to examine various explanations of the 'mystery' of the original book. He also notes that Joan Lindsay did have a variety of experiences in her life that were psychic in nature. 1. Miranda is leading Irma and Marion. 2. They end up on a plateau. 3. Irma remarks on seeing people far below and how they appear to be the size of ants. 5. Miranda spots a monolith and says it feels as if it is pulling her. 6. They pass it, then the three girls become sleepy and lay down on the plateau and go to sleep. 7. Miranda wakes up first. 8. A woman comes out of the bushes. The woman's stays (for her corset) are loosened. 9. Marion suggests they all get rid of their corsets. 10. The corsets were thrown away, but they are hanging in midair and not falling. 11. The stranger says the corsets are stuck fast in time. The woman has amnesia. 12. The woman talks a lot about their arriving. 13. She spots a hole in space, about the size of a fully rounded summer moon. 14. The girls spot a snake that goes into a hole. 15. The woman changes to a crab or crab-like thing. 16. Marion then changes the same way and goes into the hole. 17. Irma is afraid and doesn't want to change and go into the hole. 18. Miranda then changes and enters the hole. 19. A boulder falls right onto the entrance to the hole. A woman has written this section, comparing chapters 3 and 18 and noting similar events, and any differences in physical setting. She says that Chapter 18 is seen mostly from Irma's point of view. They are all unable to recognize Miss McCraw, the strange woman who appears mostly in her underthings. She speculates on the meaning of the what the girls and what Miss McCraw says, and relates these to the teachings of P.D. Ouspensky. She then compares the events to an analysis of what happens after death, like the white light of the tunnel and finally arriving at the end. The physical bodies of the three girls and the teacher are someone in what she refers to as 'Time Two,” which may be related to purgatory. Anyhow, it's not a place where physical bodies are supposed to be. She says that the disappearances were not due to any distortion of space caused by the monolith. She then talks about the astral plane, and the Australian outback having its own, and that the girls and the teacher are there. The actions of Michael Fitzhubert and Irma, though, seem to cause a shift in things, and 'the landscape's consciousness has surfaced again in the physical world.' The result is that the place where the girls and Miss McCraw ended up has also become part of the normal physical world, so they have returned to their normal physical forms are are somewhere trapped in an underground cave. As I can make out, what is being said is that the girls were recognized by the landscape as part of it, but Irma was not. The spirit of the landscape accepted them, and they were able to shape-shift into other forms and enter that dreamworld. They ended up trapped there, though, when the young boy and Irma caused an upset in events, and the dreamworld vanished, leaving the girls and the teacher trapped in the physical world somewhere underground where they presumably died.